Happy New Year! As 2019 begins, I’m thinking about time. I ushered in the New Year in Mainz, Germany. Believe it or not, it was the first time I have ever celebrated New Year’s in Germany. As we watched the fireworks over the Rhine from the window of our hotel room, I could not help but to be impressed. The Silvester revelers certainly put even Los Angeles to shame in terms of the length and duration of the firework show. Rather than just a central-show, everyone brought and launched their own. It was so much fun. Little Augustine slept through the first 20 minutes of the fireworks. It was only when we opened the window (my wife and I both like the sulfur-laced smell of the air during a fireworks show) that the increased noise woke him up. You should have seen his face. He was amazed and delighted. It marked such a happy family memory. And it reminded me, as I looked down on him, that time is running fast. You see that when you compare the pictures of him when we flew SWISS First Class exactly one year ago to him today. The idea that 01/01 wipes the slate clean is simply not true. Sure, it marks one arbitrary day to restart, but life groans on…it never stops. Isn’t that the sobering truth? Time is an ever-rolling stream and it will eventually claim all of us. Thus, it matters all the more what we do with our time, our talents, and our resources.As I look ahead, I don’t want to waste time in the pursuit of money and vanity when it comes at so great an expense. Hard work is a virtue, and so is the reward it brings…yet they are not ends in themselves, merely means to an end. My analysis of the black man ejected from a hotel in Portland was quite eye-opening. Not so much in the negative reaction of many commenters, for I expected that. Instead, it was the level of passion and detail in which many responded. Read through the comments and consider all the time it took to compose such stinging rebuttals to my own analysis. There are so many issues in which agreement will never be found, including this topic. I’m not out to earn everyone’s respect. That seems a pretty bad way to go about life. But when I write about any topic, I do want people to respect the point of view, even if it they strongly disagree with it. In order for that to occur, I need to be more empathetic. I need to be more understanding. That takes time. And time is an ever-rolling stream. 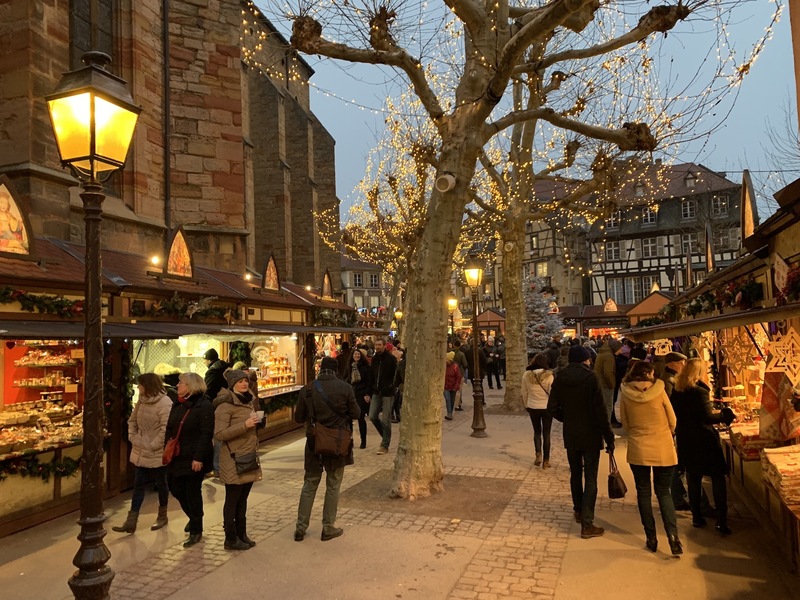 A few days ago I was in Colmar, France to visit a Christmas Market. Unlike in Germany, in France Christmas markets continue the week after Christmas. It was a very cold day, but the hot roasted chestnuts warmed all of us. I know I got taken to the cleaners, but there’s something fun about shopping at these little wooden booths and we took care of much of next year’s Christmas shopping. And while 01/01 may not really represent a new start, every day–in one sense–marks a new start. Resolutions that are broken need not be left until 2020. Rather, they can restart the moment they are broken. Life is not a linear continuum to perfection. Quite the opposite, it is marked by peaks and valleys, a time for everything under the sun. As time flies by, my resolution this year is to continue to learn, continue to empathize, and continue to do my best to show dignity to others. We’ll discuss blog-specific goals tomorrow. For now, Happy New Year and let’s all try to be a little nicer to one another this year, even when it is not deserved. Previous Article Thank You United For Bringing Back My Favorite Treat! Next Article Cathay Pacific Will HONOR Cheap Business/First Class Fares! That’s unfortunate. You are missing out on so many things if you listen to the worst news stories and only go where you think is perfectly safe. I’m also “missing out” on terrorist attacks. I (and my family) prefer the latter. As long as various western european governments do not care about keeping people safe, I will not spend my money in these countries. I approve this comment. Don’t be a fool and subject your family to unnecessary risk! I wouldn’t fly if someone paid me ten million bucks. Hey Matt. I just wanted to comment and let you know it’s posts like this that remind me even though you might have a very different perspective than mine at times, we’re all human and we could all do a little better at working to be more compassionate and understanding with one another. Despite how I feel some of your articles are framed/written overall I think your showing that your doing what you can to try and learn from others perspectives and it’s appreciated. It’s because of this and continual quality content as well as posts about your family reminding me of our similarities that keep me coming back to your blog even though I may disagree with you on topics. Your one of the view places where I know I will likely disagree with your perspective but still want to read it to try and understand better. I only hope you continue to do the same in return. Best wishes to you and your family and safe travels to you and everyone else in 2019! Thanks William. I appreciate your comment and thank you for continuing to read my blog. I hope to continue to gain insight from you in 2019. I read all your posts. Reading this one it occurs to me you might find useful something I found useful this past year. I suggest that you consider reading more by travelers of color, women of color, LGBTQ travelers, and others who face situations that are unlike your own. Empathy is hard to build when you are defending yourself. As you understandably were in the comments to your other post. But if you regularly read about the experiences of those not like you empathy grows. At least I found mine did. I also made time last year for a regular volunteer commitment with a community I was unfamiliar with and to start learning another new language, two things I did think I had time for because of travel. But I found I did. I’m not the most emphatic person. It’s hard for me. I have to work at it. But being more present to listening to others and hearing that they might experience something I don’t was helpful. When I only read news pieces about bad things happening to people like the guest at the doubletree I didn’t see their perspective as clearly. I still have tons of work to do. I hope you take these suggestions in the spirit they are intended, from one fellow traveler trying to improve to another. Every day is indeed a new opportunity for empathy and growth. Thanks Emily. Well-noted. I agree with you sentiment. Thanks for this — the style of the post reminded me a bit of Peggy Noonan’s WSJ column. I hope that comes across as a complement. Would love to see a picture of your son. Noonan is one of my favorite columnists!